My fishing log dates back to 1998, and there are definitely noticeable patterns when it comes to the location of large striped bass congregations along the Jersey Coast. 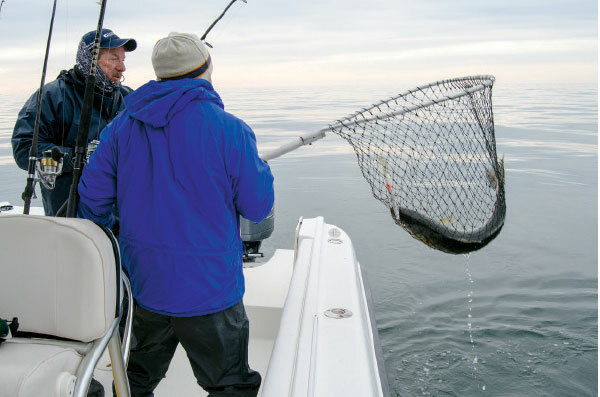 During the late 90s and early 2000s, the Delaware Bay and Cape May beaches were the places to find 30-plus-pound fish. Since 2004, the central and northern Jersey coast from Barnegat Inlet to Raritan Bay benefited from legendary bunker runs that attracted unforeseen numbers of 40- to 50-pound cow stripers. 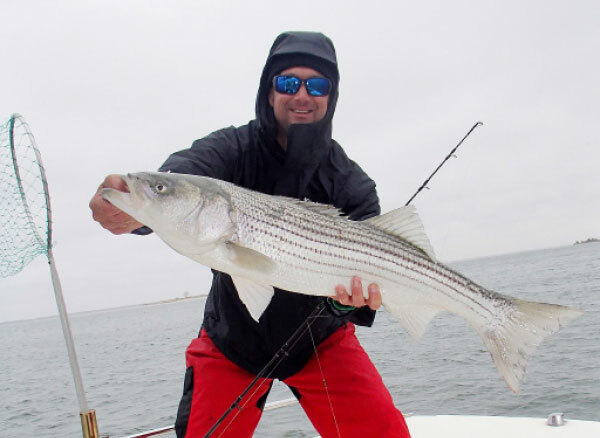 But, off the towns of Ocean City, Sea Isle City, Avalon and Wildwood, there’s been an apparent lack of large stripers during the fall run—until now. Since 2013, this 25-mile section of southern Jersey coastline has been a hotbed of linesider activity in the late fall, and local anglers are finally experiencing the big bass fishing they’ve been waiting for. One of the reasons that the South Jersey area historically misses the bulk of the fall striper run is that the gradually sloping submarine coastline doesn’t attain prime striper depth until a considerable distance offshore. From LBI to Cape May, the coastline is very shallow inshore, and the usual bass-friendly depths of 45 to 60 feet can lie well outside the 3-mile federal limit, out of range and out of legal reach. 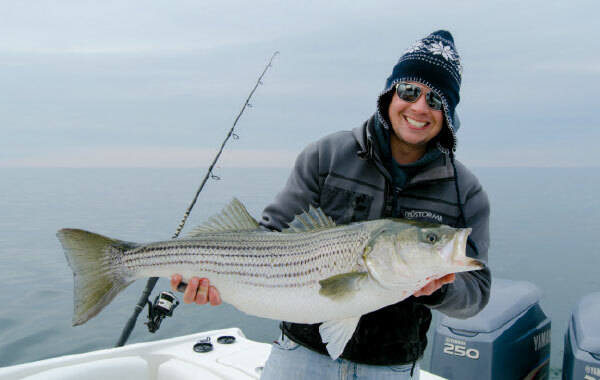 Stripers most definitely cruise by South Jersey on their fall migration, but pass too far off to legally target. 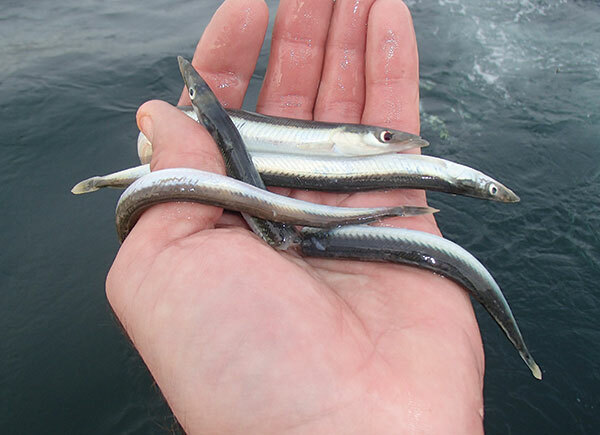 When sand eels are the predominant baitfish, umbrella rigs with tubes are the top trolling lure. However, in recent years, large schools of southbound baitfish have been hugging the shoreline, a change that may have been caused by Super Storm Sandy’s shoreline restructuring in 2012. Adult bunker, sand eels, herring, spearing, peanut bunker and rain bait have been sticking close to the coast and attracting major schools of migratory stripers. Fishing an eel deep under a large float is another productive tactic when marking schools of suspended stripers in late fall. Once the bait stacks up inshore, it’s only a matter of timing and temperature for bass to follow. In late October through early December, water temperatures average anywhere between 48 and 60 degrees, and the main bass bite seems to take place from mid-November until mid-December, before water temperatures drop too much and push the bass offshore and southward. I have joined Captain Sean on several November striper trips since 2013, with our general modus operandi trolling around the Great Egg Inlet Bell Buoy and off the Ferris Wheel on the Ocean City Boardwalk, working the depths from 30 to 55 feet. Other productive grounds have included Brigantine Shoal, the Atlantic City jetties, off Lucy the Elephant in Margate, Sea Isle Lump, and the Cuma Lumps. These spots are generally featureless and flat, with no real hard structure like rock piles or reefs to concentrate the fish, so the real key to success is about finding tiny divots or lumps in the area. 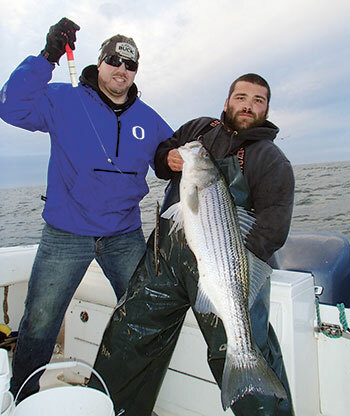 Ed Berger and Craig Rogers trolled up this 20-pound striper off Ocean City. “Hooking up is all about watching the fishfinder and finding variations in the depths, whether it’s a lump or hole,” said Reilly. “You can be running along a gradient that stays at forty feet for a long time, then see a small two- to three-foot drop or rise, and that’s where fish will be holding.” Derelict traps, coral beds or mussel beds in the area will also be fish-attracting spots. “There’s this little lumpy spot, like a dimple, and I don’t know if it’s a lost lobster trap or what, but it’s really small and fish are always holding around it.” Reilly and I fish that spot time and time again, dragging a troll pattern in a figure 8 around the area. On every pass on the down-tide side, we get lit up with linesiders. “I always go right to that spot to troll first, and most times, fish are already waiting there on it,” noted Reilly. In a featureless area, like the South Jersey oceanfront, any dip, lump or speck of structure can be an oasis. Mojo rigs allow fishermen to target deep stripers using big lures without wire line and heavy tackle. With a little southern influence from the Chesapeake Bay boys, Southern New Jersey fishermen have adopted the Mojo Rig with open arms. “Hands down, that’s our number one trolling lure,” said Reilly. 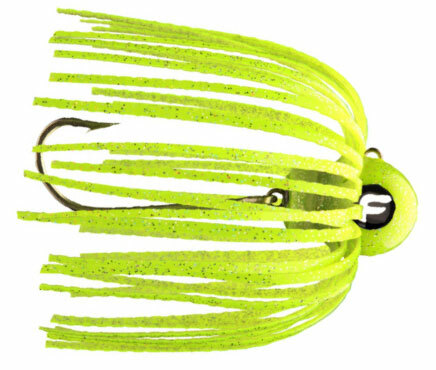 “We use up to a twenty-four-ounce Mojo ball with a smaller twelve-ounce ball trailer and colors in a combination of chartreuse and white.” We will also send back Stretch 25 and Stretch 30 plug patterns of blue/silver, chartreuse or black/white. Snagging live bunker and allowing them to swim is another excellent tactic for these late-fall stripers. Rip a weighted treble hook through a bunker school, then open the bail and wait for a pickup, or switch the bunker bait to a rod rigged with an 8/0 octopus-style circle hook. Bunker schools appear as solid red blobs on the fishfinder. Sand eels will betray their presence when the birds start diving like mad. “Sand eels are easy to recognize because the terns and gulls dive and dip their beaks into the water to pick them up,” said Reilly. “Once we see that sand eels are around, we switch tactics and either jig metals or troll umbrella tube rigs.” Metal jigs include slender-profile offerings like Deadly Dicks. Tube rigs in red, black or green, all combined with some flashers, seem to pull the most bass. One day in late November 2015, Reilly and I saw gulls diving at the Bell Buoy and sent out red 9er’s umbrella rigs, dragging through 35-knot gray and sleety winds to nail down seven bass up to 30 pounds in no less than 15 minutes.